Where will we put our beers? 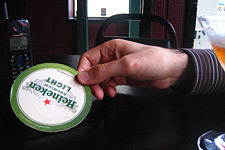 Beer coasters have long been essential to a well-kept bar. But with their leading manufacturer bankrupt, we may no longer have a place to rest our brews. For most of us, beer coasters are just an insignificant piece of cardboard tucked under our glass of ale. But some have elevated the disposable coaster, which is a common sight in pubs in Europe and North America, to a lofty status, considering it an artwork, a collector's item, building material -- or even a piece of sporting equipment. The record for beer-coaster throwing stands at 125.5 feet, while the highest beer-coaster tower, created from more than 40,000 coasters, stood proud at 9.70 meters. Leo Pisker, an Austrian, has an extensive collection of some 150,000 beer coasters from around the world. But now the economic crisis is threatening the beer coaster -- and unnerving its fans. The world's biggest beer coaster company, Katz Group, has declared itself bankrupt. Tucked away in Weisenbach in the Southwest of Germany, Katz Group, which was founded as a sawmill in 1716, had been in the beer coaster business since 1903. Katz International Coasters controlled around two-thirds of the European market and 97 percent of the U.S. market. Worried beer coaster fans are asking themselves what the future holds. Over the decades, a whole scene has built up around the cardboard coasters. Some collectors travel to buy, exchange and admire at swap meets. Others flaunt their collections on the Internet. And despite its small surface area, the beer coaster has been daubed with everything from political messages to adverts to saucy slogans. "A girl and a little glass of beer cures all woes," reads one, which features a beer mug-toting girl. The cardboard beer coaster made its debut back in 1880. Friedrich Horn, a German printing and board mill company, created small cardboard mats and printed messages on them. Before long, its simple invention had become a firm fixture under beer glasses across the country. Bar keepers liked them as they protected their tables, didn't need washing and didn't cost them anything -- advertisers footed the bill in a bid to reach new customers. But times have changed. Beer consumption is on the wane and demand for beer coasters is also weaker -- so weak, in fact, that the market leader has gone bankrupt. This article originally appeared in Spiegel Online.